آنچه سخن فوق را تایید مى‌کند، روایت صالح بن عرندس حلى، عالم بزرگوار شیعى قرن نهم در کتاب "کشف اللئالى"(4) است. وى گوید: روزى جمعى از شیعیان به قصد دیدار حضرت موسى بن جعفر علیه‌السلام و پرسیدن سوالاتى از ایشان به مدینه منوره مشرف شدند. چون امام کاظم علیه السلام در مسافرت بود، سوالات خود را به حضرت معصومه که در آن هنگام کودکى خردسال بیش نبود، تحویل دادند. فرداى آن روز براى بار دیگر به منزل امام شرف حضور پیدا کردند، لیکن هنوز ایشان از سفر برنگشته بود. چون ناگزیر به بازگشت بودند، مسائل خود را مطالبه نمودند تا در مسافرت بعدى خدمت امام برسند. غافل از این که حضرت معصومه جواب پرسش‌ها را نگاشته است. وقتى پاسخ‌ها را ملاحظه کردند، بسیار خوشحال شدند و پس از سپاسگزارى فراوان شهر مدینه را ترک گفتند. از قضاى روزگار در بین راه با امام موسى بن جعفر علیه السلام مواجه شده، ماجراى خویش را باز گفتند. چون امام پاسخ سوالات را مطالعه کرد، سه بار فرمود: "فداها ابوها" (5)؛ پدرش فدایش. در این روایت حضرت فاطمه زهرا سلام الله علیها به نقل از رسول خدا صلی الله علیه و آله مى‌فرماید: "آگاه باشید، هر کس با دوستى آل محمد بمیرد، شهید مرده است!" 1 ـ الفصول المهمه، ص 240. 2 ـ کشف الغمه، ج 3، ص 30. 3 ـ توجه به این مطلب که اخلاص در اعمال در طى یک دوره چهل روزه باعث جارى گشتن چشمه‌هاى حکمت از قلب بر زبان مى شود، اذعان و اعتراف به حقیقت فوق را سهل مى‌نماید. چون حضرت معصومه سلام الله علیها نه تنها چهل روز که در تمامى عمر شریفش مخلصانه عمل مى‌کرد. 6 - فاطمه بنت الامام موسى بن جعفر، ص 58 و 57 و اعلام النساء، ص 577. 7 ـ در کتاب اسنى المطالب پاره‌اى از روایاتى که در شان و منزلت امیرمومنان علیه السلام وارده گشته، گردآورى شده است. در این کتاب تنها احادیثى ذکر شده که در مصادر و کتب معروف و با سندهاى قوى و محکم بیان گردیده است. (امینى، مقدمه اسنى المطالب، ص 32). 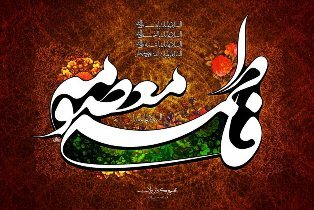 Fatima Masumah was born in the holy city of Medina on the First Day of the month of Dhu al-Qa"dah 173 A.H. His holy father was Imam Musa al-Kazim (A.S.), the Seventh Holy Imam and Imam Reza (A.S.), the Eighth Holy Imam was her elder brother. Fatima Masumah (S.A.) was the most learned scholar and very pious lady and was greatly revered by the Holy Imams (A.S.). Hazrat Masumah used to live in Medina. When Ma"mun Abbasi summoned Imam Reza (a.s) to Khurasan , she found this separation heavy to bear. After one year she left for Khurasan in order to see her brother.In 816 AD, Fatima , was traveling to meet her brother at Mashhad when she became ill at Saveh (Sava), a small town to the northwest ofQum. Fatima managed to reach Qum before she died and her mausoleum soon became a celebrated place of pilgrimage. The construction of the present (Bargah) (Holy Court) and the holy shrine of Hazrat-i-Masumeh in Qum, was started in the middle of the third century A.H. and continued during the 4th, 5th, and 6th centuries A.H. (mid 9th century through 12th century A.D.), when it was completed with a dome and vault. But it was most flourishing in the Safavid period, Shah Ismail ordered the construction of the northern ivan. During the reign of Shah Tahmasb I, 939 A.H. (1532A.D.) and Shah Abbas II, 1055 A.H. (1654 A.D.), the buildings of the (Astaneh) were completed and some important decorative works were undertaken, which have been continued ever since. The main structure of the holy (Astaneh) (Threshold) consists of the old and new courtyards, a mirror-decorated ivan, a number of Mu`azin`s cages, a portico, a sepulcher, the holy harem (Sanctuary), the Holy Tomb, Masjid-i-Bala-sar, ladies courtyard (Sahn-i-Zananeh), an ivan,thegolden dome, and several golden, silver and inlaid doors. There are a number of verse inions in (Astaneh Moq`adasseh), composed by Muhtasham Kashani, Fath Ali Khan Saba, and Shurideh Shirazi. The tileworks of the holy tomb of Hazrat-i-Masumeh, which have been accomplished during the years 605 to 613 A.H. (1208 to 1218 A.D.), bear the following designs and colors. On the tomb, there are 15 pieces of enameled tiles covering a space of 2.95 meters long and 1.20 meters wide. The sides of the tomb are covered with three kinds of tiles, namely enameled tiles with curved sides, full star-shaped (Kuakabi) tiles, and enameled tiles on which the latter are installed. There are three inions on the tomb: the first is a relief inion in Naskh style and isvermilion in color; thesecond, also vermilion, is in Kufic and the third is golden and in Naskh calligraphy. The background is azure, golden, brown or silver, and is further adorned with various ornamental motifs. According to the inions, the tiles of the Holy Sepulcher have been donated by Muzaffar ibn Ahmad ibn Ismail and the calligraphers Muhammad ibn Abi-Tahir ibn Abi-Hussain and Abu-zaid have been responsible for the inions, the former having also undertaken the manufacturing of the tiles.